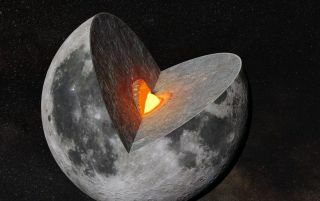 Scientists now think that a molten ocean once swirled in the moon's mantle, the layer between the crust and the core. The ancient moon may have had a gooey interior: A new study suggests that some 4 billion years ago, Earth's beloved satellite harbored a secret subsurface ocean of magma. The churning of this molten ocean may have created a magnetic field similar to the one that protects Earth from charged space particles today. Measurements of moon rocks brought back by the Apollo astronauts in the 1960s and 1970s prove that the moon once had a strong magnetic field above its surface, but how the satellite managed to sustain this field is a complete mystery. There are three ingredients for creating a planetary magnetic field, Soderlund told Live Science: a liquid, motion and electric conductivity. Earth and other planets with magnetic fields owe these features to the movements of the worlds' molten, metallic cores. The moon has a core, but it's small, Soderlund said. It's not capable of creating a magnetic field as strong as the ancient one recorded in moon rocks picked up from the lunar surface. That field remained strong until likely around 3.5 billion years ago and then gradually diminished. Researchers have offered various explanations for the strength of the ancient moon's magnetic field, from extra churning in the core caused by the mantle to some sort of disruption caused by impacts from space debris. Soderlund and her colleagues, Princeton University researcher Aaron Scheinberg and Arizona State University planetary scientist Linda Elkins-Tanton, were trying to create computer models of the moon's core that would explain the satellite's magnetic field. They couldn't, but they did find that all of their models resulted in a very hot, melty mantle, the layer of the moon between the crust and core. That led to a revelation that perhaps the melt was key, Soderlund said. The team modified their model to take a melty mantle into account. The researchers found that by assuming the existence of a metal-rich, fully molten "magma ocean" sitting right on top of the core, they could create virtual geomagnetic fields of the same strength as that recorded in real moon rocks. Even better, Soderlund said, the "magma ocean" hypothesis could explain why the moon's magnetic field gradually weakened and vanished. As the mantle eventually cooled and solidified over billions of years, the magnetic field would weaken as the amount of liquid churn diminished. A swirling magma ocean in the moon's mantle may have set up a lunar magnetic field billions of years ago. "It's like a natural evolution of the moon's cooling that we're able to have this sequential type of magnetic field generation," Soderlund said. "It's a really interesting idea that absolutely is feasible," said Christina Dwyer, who proposed the idea of the magnetic field as driven by the core being agitated by interactions with the mantle in 2011 while a graduate student at the University of California, Santa Cruz. Dwyer, who now works for Schmahl Science Workshops in San Jose, California, wasn't involved in the current research. Because it brings the driver of the magnetic field closer to the surface, the hypothesis overcomes the problem that the core itself is too weak to create the field, Dwyer said. More measurements and experiments on moon-rock conductivity could help show whether the magma-ocean idea really fits the evidence, she told Live Science. "How big is the core? When were different portions of it liquid? [It all] lets us know about big-picture formational questions about the moon," Dwyer said. And because the moon formed after being flung from Earth due to a giant impact early in the solar system's formation, understanding the satellite's evolution could help explain how the Earth formed, too.